It's already known that some species of moth have evolved a range of defensive mechanisms to evade insectivorous bats' highly-tuned echolocation (biosonar) detection skills. The discovery of a wingbeat-powered sound producing structure in the wings of a deaf moth is completely new. Many larger species of moth use ears tuned to detect the echolocation calls of bats to provide an early warning of approaching bats allowing them to perform evasive manoeuvres. While others, such as some silk moths, have hindwing tails that produce salient echoes which act as false targets to bats—like the towed decoys fighter planes use against radar guided missiles. The team of researchers from Bristol's School of Biological Sciences and the Natural History Museum, London, were studying a group of smaller British moths known as the small ermine moths (Yponomeuta species), and discovered that despite their lack of hearing they were making continual clicking sounds whenever they fly. Unlike other species of moths, that produce sound in response to detecting an approaching bat, small ermine moths have evolved to produce continual warning sounds. The sounds these moths produce are very similar to sounds produced by larger moths, such as the tiger moths, which warn bats of the moth's distastefulness or toxicity (known as acoustic aposematism). At night an unpalatable moth cannot provide a bat with a conspicuous warning colour, so instead it warns its predator acoustically. The team suggest that small ermine moths are acoustically mimicking unpalatable, sound producing moths, to warn bats of their own distastefulness. Typically, anti-bat sounds are produced by structures called tymbals, small areas of thin cuticle on a moth's body, which are connected to a muscle. As the muscle contracts, the tymbal buckles and produces a click, then as the muscle relaxes, the tymbal snaps back to its resting state and produces another click. 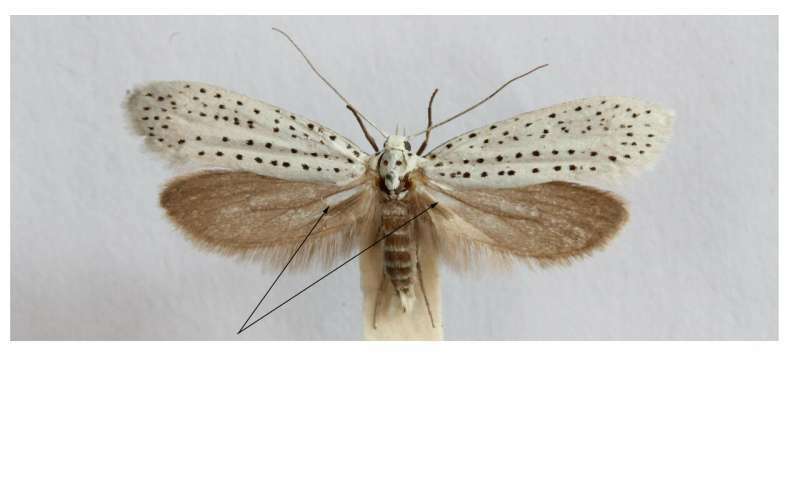 However, the wing-based tymbals of small ermine moths are not connected to a muscle, instead sound production is initiated by the moth's wingbeat during flight. Liam O'Reilly, the study's lead author and a Ph.D. student at Bristol's School of Biological Sciences, said: "Bat defences in larger moths are well studied, however, the defences in smaller moths are not. "Many animals use a conspicuous visual signal such as bright colouration to warn their predators of a defence, but at night an unpalatable moth cannot provide a bat with a visual warning signal, so instead it warns its predator acoustically through a clear sound—loud high frequency (ultrasonic) clicks. "The fact that sound production in these moths has remained undiscovered for so long reminds us of how little we know of the complex acoustic world of bats and moths."